While in Florida and undergoing tests in the hospital, Metropolitan Philip suffered a minor heart attack on Sunday. He is in an encouraging situation in ICU. A prayer service for His Eminence will be held this Monday afternoon at the Archdiocese Headquarters. We ask all of you to hold prayer services for his speedy recovery. 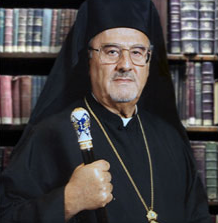 Update Tuesday Mar 11: Thanks to your collective and fervent prayers, Metropolitan Philip’s status has improved. He is extubated (i.e. the doctors removed the tube from his mouth) and has conversed with his relatives and friends around him. He also conversed with His Beatitude Patriarch John X on the phone. Please continue to pray for his speedy recovery.